Everyone wants to feel appreciated. This is especially true when it comes to members of an organization. Your members expect to receive the benefits listed for their membership level. But going above and beyond that, by recognizing your members’ accomplishments and dedication to your organization, can endear your organization and create loyalty. When I was an Executive Director I felt that I barely had time to breathe let alone get to know each and every one of my members. That’s why it’s important to utilize all available resources to keep up with your members. Social media offers an opportunity to connect with your members. Many organizations utilize social media to post updates about themselves without realizing it is also a great place for member recognition. In addition to posting about your members on your social media pages you can also interact with them on their pages. Make sure to comment when they post about their accomplishments. Sharing or retweeting is also greatly appreciated by everyone using social media. Networking events are a great place to catch-up with what is going on with your members. Make sure you not only update your members on the latest organization news but also find out what is going on with them. Make it a group effort. Send a quick email to committee members, board members and employees after events and ask them to reply with any member news that they learned. This way even if you don’t get to talk to everyone at an event, you still know who has great news to share. You can also try having a “Good News” whiteboard at the event. Members can add announcements about their business and read other member’s announcements. Make sure to take down the information and share it through other avenues as well. Allocate room on your website for for posts about member accomplishments. Encourage your members to email their accomplishments to you for inclusion. This not only helps your members but can also become a membership marketing tool for you. Visitors to your website will see your member’s success and relate it to your organization. They may also see members they want to connect with which will encourage them to attend your events. Google Alerts can email you whenever anything new appears on the web about a member. Just follow these few simple steps. First you set up a query with Google for the terms you are interested in. In this case it would be your Member’s name or their business name. Then Google checks regularly to see if there are new results that match your terms. When they find results they send them to your email. This is a great way to quickly track member accomplishments. Google’s guide can help you get started on setting up your alerts and give you some tips on the best way to optimize them. Whether it’s winning an award, launching a new product, publishing a great blog or helping your organization reach a goal accomplishments are always better when shared. Social media offers a lot of opportunities to showcase member accomplishments. Email newsletters are another place to highlight your members’ accomplishments. 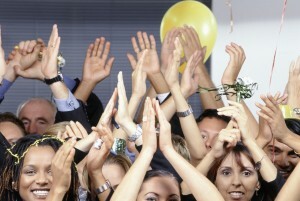 Meetings and banquets offer a great opportunity to share member accomplishments. You can give out awards to recognize members’ volunteer efforts. Setting aside 10 minutes for these announcements will give your members an opportunity to shine. Modern email is wonderful and pervasive, so much so good old snail mail is often forgotten. A card or letter in the mail, with a short hand-written note, can be a welcome surprise. You could send a thank you card for volunteering, or a congratulations card for a member’s accomplishments. A little here can go a long way. Your members have many options of groups and organizations to dedicate their time and money. By recognizing your members for their accomplishments and dedication to your organization, you show them that you value their membership. Additionally, recognizing their accomplishments creates another form of publicity and added benefit for them.